experience the FinReg Global website perfectly. What is a “Directors' Compliance Statement”? Directors of relevant companies are required to meet the requirements of Section 225 of the Companies Act 2014. As part of meeting the requirement of Section 225 directors must make a statement in their financial statement noting that they acknowledge their relevant obligations for securing the company's compliance and confirm that they have complied with the 3 requirements of Section 225. Identify if the company has to produce a Directors Compliance Statement (e.g. based on balance sheet size and turnover) and what areas need to be covered (books and records, tax legislation and market abuse regulations). Identification of company’s relevant obligations based on the criteria laid out in the act and the activities they undertake. The solution captures the arrangements in place that demonstrate how you meet your relevant obligations. Document and manage the policies, processes and procedures in place and those responsible for implementing them whether they are employees or external service providers. 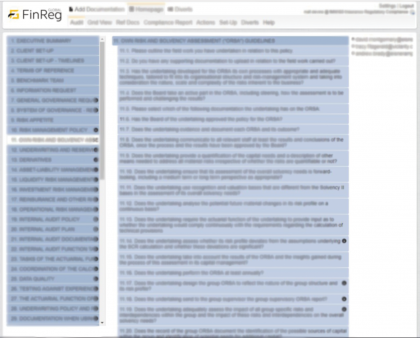 Upload reports from all relevant stakeholders e.g. administrators, fund service providers, accounts, tax advisors, legal advisors. Complete the annual review of the company’s arrangements to meet its obligations. Demonstrate how you have obtained reasonable assurance that the arrangements ensured material compliance during the period under review. The solution automatically generates the compliance statement based on obligations identified, arrangements in place and the review conducted. The content of NAViG8 – Directors’ Compliance Statements is aligned to and underpinned by the requirements of Section 225 of the Companies Act, 2014. 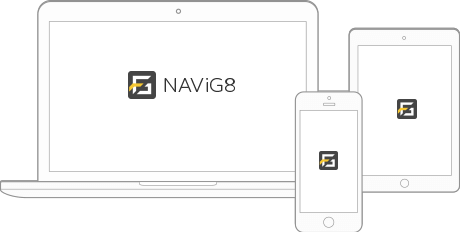 NAViG8 enables directors to manage and have full control of the process of identifying their obligations and documenting how those obligations are met – whether by employees or external service providers. We have broken the above down into 20 simple and easy to use sections within the solution. The solution enables delegated employees and service providers to record the output of their performance of the company’s arrangements for the period under review and document their assessment of compliance. Directors incorporate this delegated output into their review. View sections in detail, with questions and sub questions expanded. 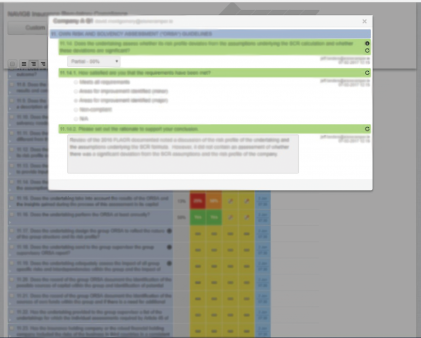 Immediately see via colour coded boxes the compliant / non-compliant / not answered status of all questions and sections. 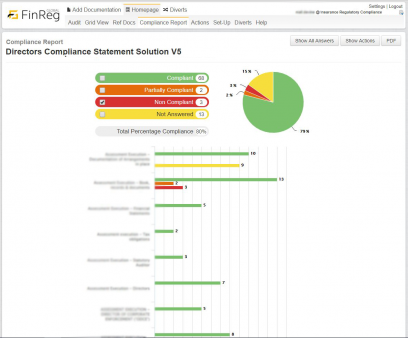 Measure your progress towards compliance over time through the columnised time bounded view. The Solution has full audit trail functionality built in. Who was assigned what question, and when, is all recorded. Who then answered what question, when, and of course the answer itself are all recorded. 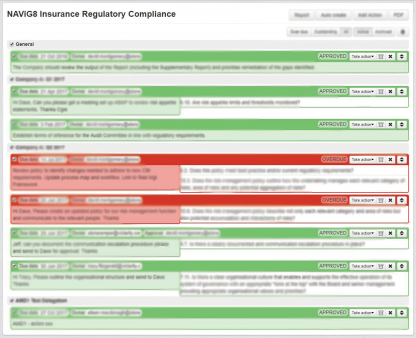 New, improved and updated answers are all recorded separately and incrementally as you iterate your way to compliance. Updated policy uploads, and reassignment of questions are all also recorded as part of the audit trail. 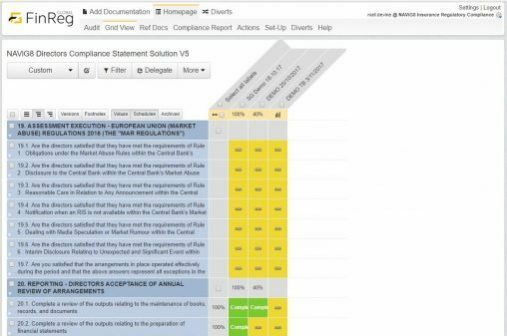 NAViG8 enables evidence-based review and confirmation of acceptance of the documentation and arrangements in place and sign off on the Directors’ Compliance Statement report. Directors review the stated arrangements in place and the nominated director signs the Directors’ Compliance Statement report on behalf of all the directors. The review and the final report are captured in the software, and preserved for future audit requirements. The action tracker functionality allows users to keep track of status at all times and to send reminders at scheduled stages, or as needed. 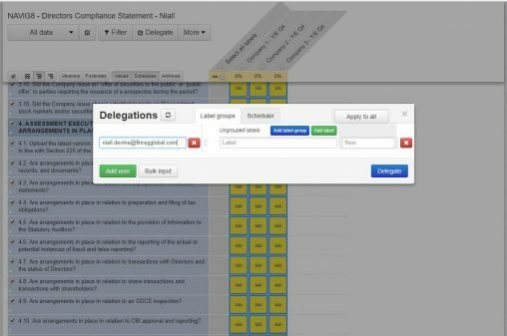 Document manager – relevant documents are uploaded to the NAViG8 – Directors’ Compliance Statement solution, facilitating examination of policies and procedures against requirements. Guidelines and requirements are bookmarked and linked to relevant sections. 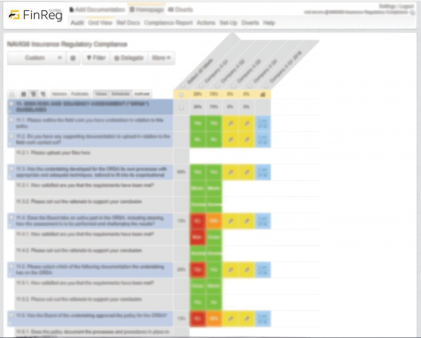 The dashboard and tables show obligations, arrangements in place and stages of the review process. Reports show a point-in-time assessment. The dashboard can be filtered to the users desired view. 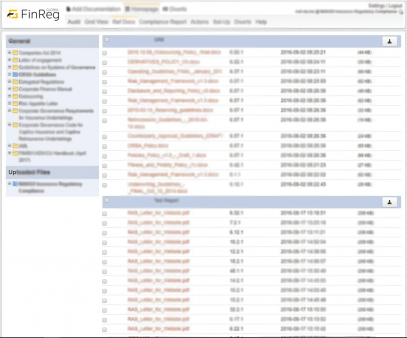 Filter reports to particular sections and easily export to PDF or Excel as needed. Generate the Directors’ Compliance Statement. Administrators can allocate and / or restrict user access to meet your needs. No restrictions on the number of users. Users can create custom views. 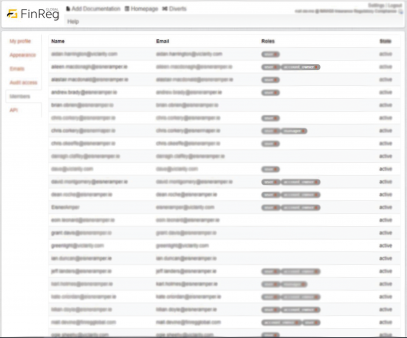 Allocate actions to any individual, internal or external, without compromising data integrity. Please contact sales for pricing and tech specs. Give our expert team a call to find out more about us and how our software can help you +353 1 90 73410. Receive information on our newest releases, events, update to date industry news, insights from experts, and much much more.